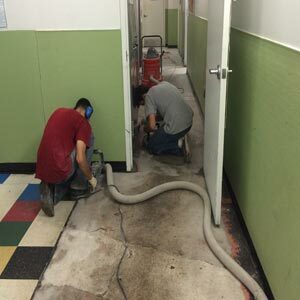 The removal of the carpet mastic can be a two-stage removal process. Stage one is to remove the bulk of the mastic without damaging the surface and stage two is to remove the thin residual glue and introduce your first scratch pattern. We use a multitude of different approaches to remove the bulk without damaging. We use scraping machines, carbide scrapers, or a chemical adhesive remover. Another option can be to utilize PCD diamonds or a combination of PCD diamonds with metal bond diamonds. Black VCT mastic will sometimes stain the concrete. When considering a finish on the floor be aware of the possibility of seeing the outline of the previous finish. 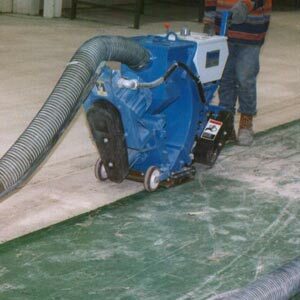 Concrete grinders use an abrasive to grind or polish . The use of diamond tooling is the most common type of abrasive used on concrete grinders and come in many grits that range from 6 grit in a metal bond to the high thousands in a resin bond tool. Between the metal bond and diamond bond tooling, there is a copper, hybrid, or transitional tool that can be used. 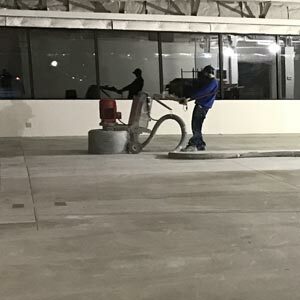 Grinding concrete is not as aggressive as scarifying, or shot blasting , but is an accepted prep method for concrete surfaces.